All transactions are safe and secure with a reliable history in online purchasing behind each of our associates. Buy the Bill and Sookie t-shirt to own True Blood clothing and merchandise. 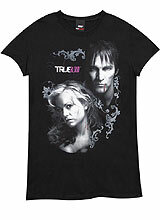 This True Blood t-shirt features our favorite couple, vampire Bill Compton (Stephen Moyer) and Merlotte's telepathic waitress Sookie Stackhouse (Anna Paquin), posing together. These two won't let Eric, Jason, Tara, Sam or any other Bon Temps citizen end their relationship. In fact, it appears to make them a stronger couple. Let us all give thanks to the Tru Blood drink and what it has done for vampires and humans alike. For your own consumption, the True Blood beverage is available for you to toast Bill and Sookie's love. In addition to the Bill and Sookie tee above, browse the True Blood Clothing Gallery for more apparel like men's and women's clothes, kids shirts or hoodies.